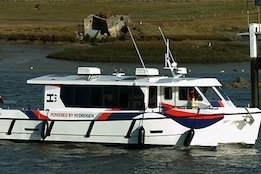 Lloyd's Register (LR) says the recently christened Hydroville is the first LR classed vessel to use hydrogen to power a diesel engine. As Ship & Bunker reported earlier this month, the CMB Group (CMB) recently christened the Hydroville, a 16-passenger vessel that will be employed on daily trips between Kruibeke and Antwerp. "The project is a showcase for LR as well," said Ed Fort, LR's Global Head of Engineering Systems. "It demonstrates our capabilities in hydrogen risk assessments and is a stepping stone towards the wider use of hydrogen as a fuel for combustion engines and alternative power generation technologies such as fuel cells. LR is taking a leading role in assuring the safe deployment of alternative fuel sources for shipping." Katharine Palmer, LR's Global Sustainability Manager, commenting on the new vessel, said: "there is no doubt that decarbonisation is a huge challenge for our sector and we all have a clear responsibility to ensure actions are taken to drive our operational emissions to zero at a pace matching actions taken across the rest of the world and other industry sectors."